These are good quality slippers that last. They are a little pricey but you get exactly what you paid for. My granddaughter took them right out of the box and put them on herself and after a few minutes she didnt even notice them. They have nice grip on the soles. My daughter & daughter in law both have these for their daughters and love them. I bought two pairs to give as gifts! Wonderful quality. Great material. Very comfortable for my 5 month old. Shoes are great but return policy is not! Bought these soft sole shoes for my granddaughter, who is 14 months old. 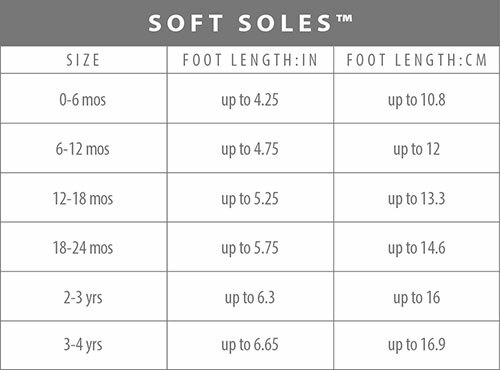 Bought size 12-18 months. They were way too big. Could not exchange them, only send them back and rebuy smaller size. Paid for shipping 3 times for a total of $20! The shoes are so cute & well made but will not buy from this company again. Robeez Note: Pam, we are going to have someone from our Customer Service team contact you to help you with your issue. Thanks. I love Robeez and buy them for all new babies. They used to have much cuter designs, boys and girls. As well, these shoes that arrived have a chemical smell. Used to open the box and smell leather. Go back to what was good in the beginning. I purchased these shoes for my 6 month old granddaughter who had great difficulty keeping her socks on! Not only did they stay on, they look adorable just like she does!